What does it feel like to learn? Have you ever tried to juggle? You should try it in a roomful of 40 non-juggling teachers. The instructor gave us each one ball. It takes concentration to toss a tennis ball in a gentle arc to the non-dominate hand, but it is nearly impossible for that hand to return the ball along the same arc. After a few minutes, the majority of us were smugly tossing right, left, right, left, right, left.... We were juggling! Well, that is what it is supposed to look like. In reality, the non-dominate hand notices the ball and panics, releasing its ball with enough velocity to break a window across the room. It was chaos. As we got better at controlling two balls, we were given a third. Before long, most of us were doing a fair job of juggling. We certainly did not look like jugglers at the fair. They laugh, talk, and eat apples while juggling. 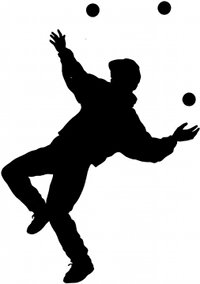 Most of us could not close our mouths and our arms were flailing to catch balls that were wide of the gentle arc, but we were juggling. Before we were ready to give up our balls, the presenter collected them in his buckets and had us reflect on our juggling lesson. His goal was not to make jugglers out of a bunch of teachers. Rather, he wanted to give teachers a chance to experience what children feel when learning something difficult in a roomful of learners. Our juggling session had been active, messy, loud, chaotic, embarrassing, competitive, frustrating, cooperative, intimidating, fun, and challenging. Could this apply to our classrooms? He asked us if teaching strategies we use with children would have helped us learn how to juggle. Should we have read a chapter and answered questions? Should we have listened to a lecture? Should we have connected dots or written an essay? What if there had been a written test at the end of the session to show whether or not we met a standard. And, what if there was a chart on the wall to compare how well each of us was progressing? We had a lively discussion about expectations, strategies, and outcomes. We talked about how children learn to read, write, figure, and become social beings. Incredibly, it sounded a lot like learning to juggle! Challenge: Put yourself into a difficult new situation. Re-experience what it feels like to learn.